Lock in a great price for Hotel Bad Horn – rated 9 by recent guests! Staying at this hotel was one of the best choices during my trip to Switzerland. I really enjoyed the service and the treatment of the friendly staff. I was even upgraded to a bigger suite than what I booked for free. Super friendly staff, lovely views over the Lake, wonderful Spa and little gym. I can highly recommend this beautiful, friendly and warmly welcoming, stressless hotel. I was upgraded when I came. I am happy with everything and will definitely come back soon with some friends. Well worth money also. Proffesional flexible staff. Very good food. Hotel is clean and stylish. No cons. Large room, nice facilities. Nice view over the lake. The scenery, location, spa and attention was excellent! First time in my life, that following my order of Whiskey at the Bar in Roof Floor, I was not asked if I want a Single of Double. I got a solid good drink - without counting the drops. Great Bar. Only for this we will come again. Hotel Bad Horn This rating is a reflection of how the property compares to the industry standard when it comes to price, facilities and services available. It's based on a self-evaluation by the property. Use this rating to help choose your stay! Set right at the shore of Lake Constance, this maritime-style 4-star hotel in Horn dates from 1827. It includes a 4.9 ft² spa area with an indoor pool, 2 restaurants, 2 bars, and a private shipping pier. The elegant yacht Emily is available for excursions. 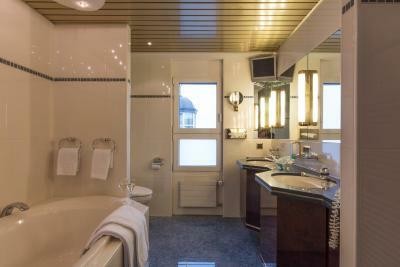 Hotel Bad Horn’s spa area includes various saunas and steam bath, an outdoor hot tub, a separate women’s spa, and private spa suites. A wide range of massage and beauty treatments is available. There is also a small and modern fitness room. The Bad Horn Hotel’s bright rooms feature an elegant maritime ambiance and include mahogany and brass furnishings. They feature a seating area, satellite TV, a mini-bar, and a bathroom with hairdryer. Most overlook the lake. The Al Porto serves Mediterranean food and overlooks the lake and in the Captain’s Grill restaurant you can enjoy international cuisine. The Faro Bar and the Sea Lounge Bar serve a wide range of drinks and also offer views of the lake. Free private parking is available on site, including free use of a garage opposite the hotel. It is 1,150 feet from the public shipping pier and 1,300 feet from Horn Train Station. Arbon is 2.5 mi away, and it is 8.1 mi to Romanshorn. When would you like to stay at Hotel Bad Horn? Comfortable rooms styled in maritime blue with lake and street views. These spacious rooms offer lots of natural daylight. Some of them also feature a small balcony. 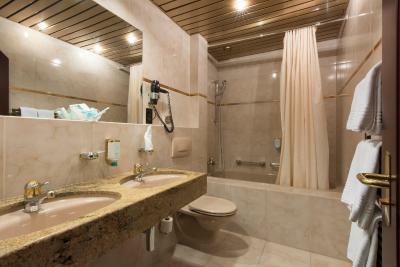 Very spacious junior suite with a lake-view balcony, a living area, satellite TV, a mini-bar and a bathroom. House Rules Hotel Bad Horn takes special requests – add in the next step! One child under 12 years is charged CHF 45 per night in an extra bed. Hotel Bad Horn accepts these cards and reserves the right to temporarily hold an amount prior to arrival. most of coat-hangers were fallind down !! There was a wedding the night i was there. Music was very loud! Only rooms available when we booked were at the back of the property which is directly on a very busy road with traffic beginning from 3.00am. No Air Conditioning so with windows open had 3 very sleepless nights at great expense. Restaurant didn't meet the expectations; very small schnitzel, very salty potato's - glass wine filled-up half - and that all very expensive. Wifi - you need to get a voucher at the reception to get connected to the Wifi. no kettle or iron was a little surprising, especially for a hotel this nice. Only 1 electric socket in Room. And this in 2017. No charging Adapter for Mobile telephone. No Air Conditioning unit. Not the standard of a 5 star Hotel. No A/C in rooms - during hot weather to hot for sleep. Very good hotel with nice personal.